Powerful cleaning agent with active ingredients that removes salt stains and soap scum. 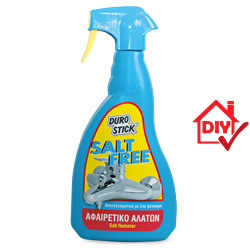 It easily removes sea water stains, rust and limescale. Suitable for use throughout the household. Use it to clean and restore the lost luster in faucets and showers, tiles and bathroom accessories. Also suitable to use in stainless steel sinks, tiles as well as clothing irons and steamers. Remove salt stains and rust from all the stainless steel parts of boats and maintain their impressive sheen. Furthermore, it is deemed necessary to hotels and restaurants as well as hospitals and food service in general. Rinse with plenty of water and release a long lasting fresh scent.